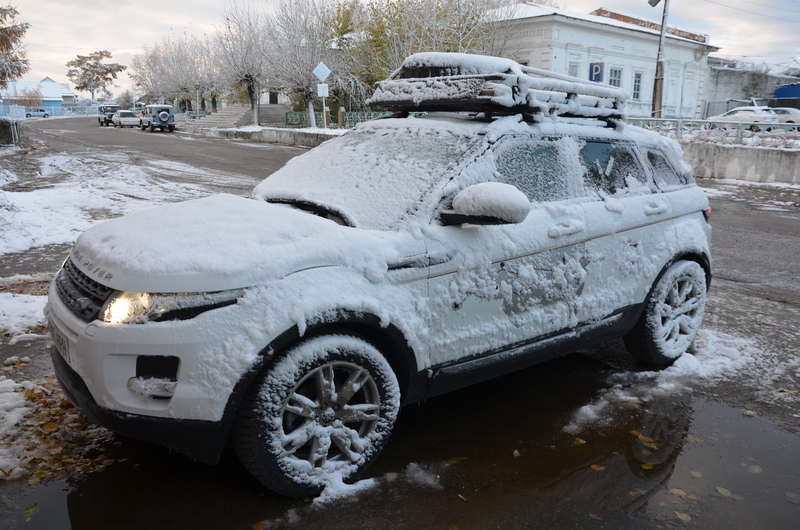 The morning welcome today came in form of a white car even whiter – covered in snow! At -2 degrees and windy, a freezing cold welcomed me as I left the hotel to drive to the border. I barely got the doors open, and had to stand in a big half-frozen puddle on both sides of the car as I packed. 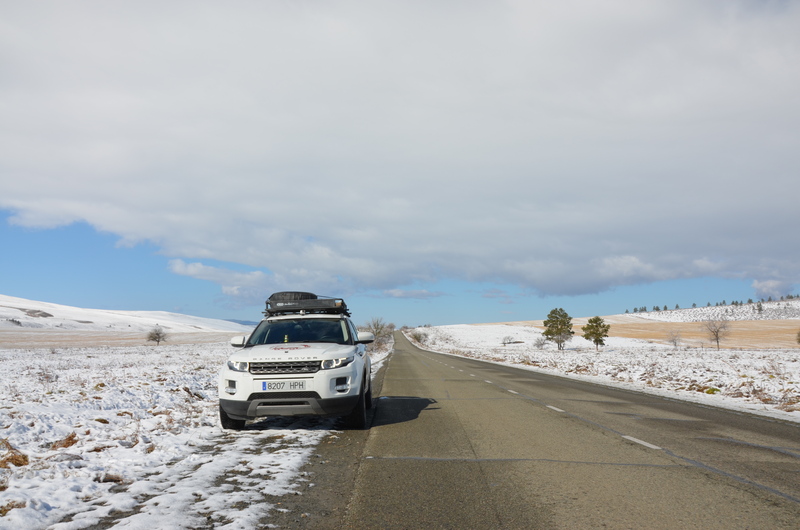 It took quite a while to get the car warmed up, but the blue sky and sun behind the hills on the Mongolian side of the border, cheered me up. At 09:15 I reached the border, it hadn’t opened yet it seemed, contrary to what I had learned last night. I waited until 10:00, when the cars were let enter and the usual procedures began. The last border by car was a long time ago, I had forgotten part of the process. The Russian side was easy, no hassles, officers were friendly. I just had to wait much on every step. But inside a heated car making hot coffee and tee for the day that wasn’t too much of a problem. Shortly before 11:00 I left Russia, and drove into Mongolia finally! There border procedures were equally easy, but the process was lengthy, requiring many seals and three checks of the car by different officers. But with a little patience, a smile and some walking around from one desk to the next, I got through, until the “senior customs official” declared: “welcome to Mongolia!”. At the exit I bought an insurance for the car and avoided the money exchangers and SIM card pushers. And at noon I was on my way through a sun lit, all white hilly landscape covered in snow. 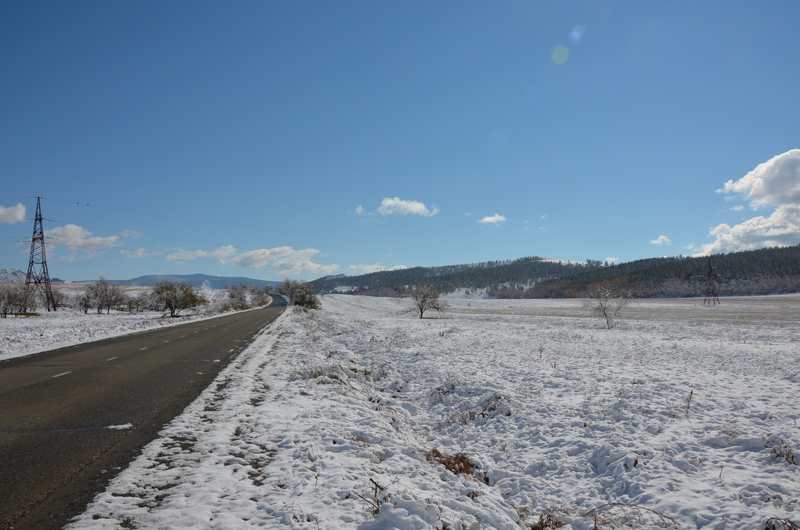 The first town, Sukhbaatar, passed shortly afterwards, and past that on both sides the road was lined in short trees in frozen snow, that reflected the sunlight in its crystals. A magic sight, I drove through it for a while. The road was good, few cars on it. 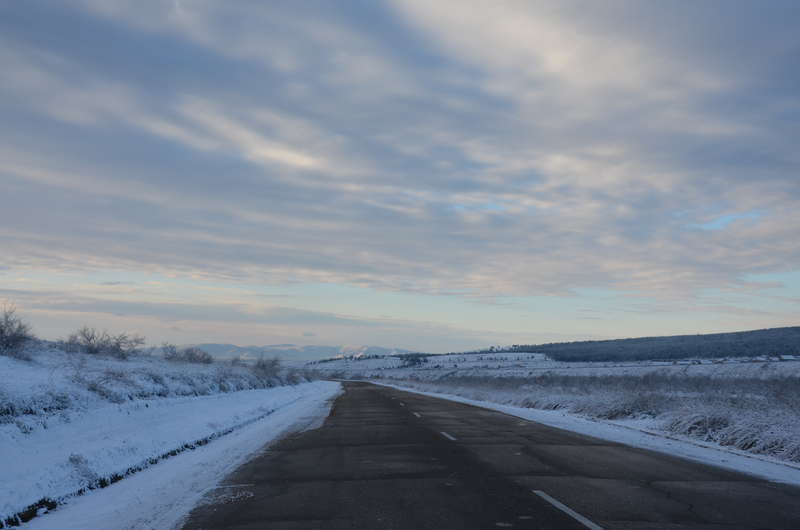 Mongolians are either speedy drivers or quick overtakes, so I could make good progress. The sun came out, and although outside temperatures stayed around zero degrees all day, inside the car it got very warm. The further south I went, the more the snow disappeared. At around 15:30 I reached Ulaan Baatar finally. Past some hills a plain opened up in front and the city extended in it. Several high smoke stacks on the southern side blew out big clouds, but fortunately towards the mountains outside of town. Traffic became very intense, I found myself in urban stop and go fighting for every cm of road with aggressive and ruthless drivers around me. In this town cars just drove, and everybody else had to get out of the way or be faster. The city itself was nothing spectacular, I had read about it in the LP guide already. Skyscrapers were popping up like mushrooms in the center of town, the influx of fresh money and new business was clearly visible in the buildings, cars, boutiques that all seemed like a new layer put over a socialist, poor previous city. I took a walk around town to get cash and buy food. It was still freezing cold, and I was wondering what to do over the next days if temperatures stayed like this. The next town on the route was Astana in Kazakhstan, several thousands of km away from here to the west. In between, it seemed I had three options: tent, lousy Soviet style accommodations, or yurtstays with local shepherds. Thinking about the yurt experience in China I wasn’t very inclined for the latter. Soviet-style accommodation is no fun. But camping at zero degrees isn’t either. I’m just going behind you. Good luck guys!